Earlier this week, I blogged about Conan the Marketer, and how his letter to the press was pure genius. I was not the only person moved. 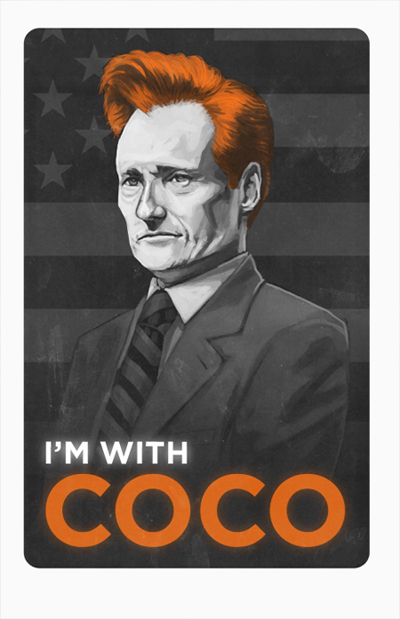 I mentioned Team Conan in the post, but someone else deserves a nod: I’m With Coco. I’m With Coco is the brainchild of Mike Mitchell, and the Facebook Fan Page already has over 120,000 fans. There will be a rally tomorrow in front of Universal Studios, and Mr. Mitchell is getting calls from the press and hopefully a lot of attendees. More so, I’m With Coco is another testimony to the power of social media, and how quickly and swiftly you can mobilize an army. If people are passionate enough about a brand or cause, Twitter and Facebook are where they gather to talk about it. Now if we can just get everyone who has joined I’m with Coco to donate to the Haitian relief fund, we have a social media army ready to rally and do good. I’m personally a member of I’m With Coco, and I’ve donated, so I’m With Coco and With Haiti. This entry was posted in Social Media Practices and tagged Conan O'Brien, Haiti, I'm With Coco, Universal Studios. Bookmark the permalink.